Truly inspired! 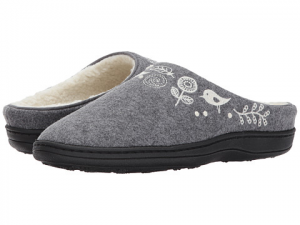 These slippers feature authentic 100% boiled wool uppers and linings with original embroidery detail. They have a fully contoured footbed of molded CFC-free PU with enhanced heel and arch for ultimate, long-wear comfort. This slipper has an island sole with skid-resistant tread. They are fully lined in soft Sherpa fleece. Lofty Acorn memory foam midsole over a comfort cushion layer of featherweight EVA combines with an enhanced raised heel and arch for stability, support, and total comfort. The Talara Mule slipper is non-slip weatherproof sold for indoor or outdoor use”.